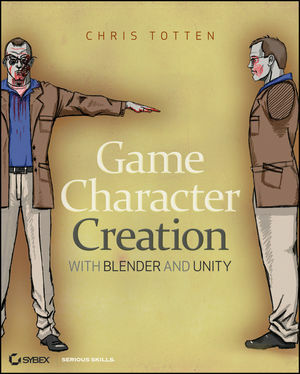 Chris Totten is a Washington, DCbased game designer, writer, and professor. He teaches character development, 3D modeling, and animation for games. Chris has participated in independent game design projects as an artist and animator; written for gamasutra.com and videogamewriters.com; and has been a guest speaker at East Coast Game Conference, GDC China and Dakota State University's Workshop on Integrated Design. The normal map baking method described in Chapter 5 (see the section titled "Setting Up and Baking Normals" on pages 129-130) has been updated in the most current versions of Blender (2.63 as of this writing.) There is now a check box in the baking panel of the Properties Editor's Rendering context labeled Bake from Multires. Checking this box creates normal maps from multires sculpts of a model without having to have two copies. To use this checkbox: 1. Separate the character model into parts (this saves on memory.) 2. Keep the Multires Modifier on the model 3. Enter the Rendering context of the Properties Editor and scroll down to the Bake panel. 4. Select Normals from the Bake Mode list. 5. Check the box labeled Bake from Multires. 6. Bake normals on each body part then continue Chapter 5 as written from the section, Applying Your Normal Map. 7 176 Text correction: Typo under "Adding Inverse Kinematics to Limbs"